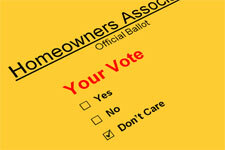 Voting to amend homeowner or condominium association (Association) governing documents can be a difficult process. Additionally, when an Association’s governing documents require a “supermajority” vote to enact the amendment, the process can go from difficult to nearly impossible. A “supermajority” refers to a vote requiring approval by more than a simple majority (any amount over 50%) of the membership. Voter apathy, busy schedules and other issues can make achieving a supermajority highly impractical, particularly for larger Associations. Fortunately, Civil Code Section 1356 provides a form of relief for Associations being stifled by onerous supermajority requirements, allowing Associations to petition the court for a reduction in the percentage of affirmative votes necessary for an amendment. Such a petition was at the heart of the dispute in the recent unpublished case of Quail Lakes Owners Association v. Kozina (2012). A court may grant the petition if the Association satisfies the six statutory requirements of Section 1356. These requirements include: (1) the Association has provided at least fifteen (15) days notice of the court hearing to all members, mortgage holders, and other parties entitled to notice, (2) the balloting was properly conducted, (3) reasonable efforts were made to allow all eligible members to vote, (4) owners having more than fifty percent (50%) of the votes voted in favor of the amendment, (5) the amendment is reasonable, and (6) the granting of the petition is not otherwise improper for any reason stated in Section 1356(e). In Kozina, an owner challenged the granting of the Association’s petition on appeal, claiming that the 15 day notice period was insufficient, and furthermore that the court had failed to provide evidence that it gave each element careful consideration. The appeals court found in favor of the Association, noting the court need not detail the affirmative evidence or reasoning behind its findings. The ruling illustrates how judges are afforded great deference in determining whether an Association has satisfied the requirements of 1356. A petition to reduce a supermajority voting restriction is likely to be successful where an Association strictly adheres to the requirements set forth in Section 1356. However, as the courts have nearly absolute discretion in weighing the above noted factors, the outcome of any Section 1356 petition is not entirely predictable. Associations being stifled by a supermajority voting restriction should contact their HOA attorney for guidance.